Bhubaneswar: Union Health Minister JP Nadda on Saturday laid the foundation stone of a satellite centre of Bhubaneswar AIIMS in Balasore. 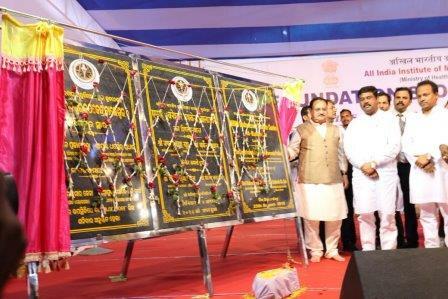 Union Petroleum Minister Dharmendra Pradhan was present on the occasion of laying the foundation stone for AIIMS Bhubaneswar satellite centre. Nadda said a 300-bedded multispecialty hospital will be established in 24.91 acres of land as a satellite centre for AIIMS Bhubaneswar. “The satellite centre for AIIMS Bhubaneswar is intended to widen and improve patient care services by creating state-of-the-art infrastructure, bringing specialised healthcare services within reach of people in the region and reducing the average distances served by an institution,” said the Health Minister. As the state government has rejected implementing Ayushman Bharat Yojana in Odisha, he said people of the state should not be deprived of the benefits of the world’s largest healthcare coverage plan on the grounds of political differences.